My quest for sublime cupcakes has been in gear for approximately 10 years. More accurately, my cupcake affair began as a kid when my Mother made chocolate cupcakes using the recipe on the Hershey's Cocoa box. Sometimes she used paper holders, but if we were out of them, she pressed on and made them anyway. Her frosting was always the same -- Minute Fudge. I still use her recipe for brownies because it really is like eating fudge. Some could consider this chocolate overload, and if you are one of those people, I will never judge you (yes, I will a little bit). ​Oh, that frosting is quite basic; it consists of sugar, butter, cocoa, milk, pinch of salt and vanilla. However, the recipe name is not realistic as it takes much longer than a minute to create perfectly creamy fudge frosting. Putting it on cupcakes? Not so easy, but my Mother managed it with skill. You get the idea. I love cupcakes, okay? Some of my cupcake adventures have already been documented. There was the time we flew to Los Angeles and back to our home (at the time in Columbus, Ohio) in one day, just so I could go to Sprinkles Cupcakes in Beverly Hills and sample their goodies. Then the many times we have driven to Coral Gables, just to go to Buttercream Cupcakes. Not to forget the time my daughter-in-law and I went to DD's Cupcakes in Jupiter on the Gender Reveal Day of her pregnancy. So, my radar is always on high alert for cupcakes. I don't mean the ones from the grocery store. No, I'm talking about gourmet cupcakes, made with fine ingredients by bakers who are really artists. Imagine my delight last week when I spied a Groupon for a place in the Palm Beaches featuring a deal on cupcakes. The photo on the Groupon touting Ladybug Cake Creations caught my eye. Yes, it was of cupcakes. Yes, this was delightful because there really are not that many gourmet cupcakes hanging 'round these parts. If so, I have failed to find them. The odd part of this adventure, is that I am not known (ask G) for my tremendous use of coupons of any sort. Yes, I love deals, but I tend to be the type who carries coupons around in my purse where they never see redemption, as it were. Reading the text, I was, at first, confused. Where, exactly, was the location, and how had I missed it up to this point? Upon closer inspection, it became clear that Ladybug had no retail outlet. Delivery only. While it is always good to peer into a display case of confections, I was all sorts of A-OK with this call in, order, and receive delivery situation. The only problem? What to order when I knew so little of this bakery? Because the Groupon was such a deal ($15 for about a $40 value), you could only select two flavors. Facing such an important decision, as I would be writing about these little cakes, I admit to being a bit rushed and flustered when placing my phone order. The resulting selection was vanilla and orange dreamsicle, and I was promised they would be made fresh for delivery the following Wednesday (yesterday). You work with Ladybug on your delivery date and times. With anticipation, I looked forward to my delivery, which was to be sometime after the noon hour. Shortly after noon, the cupcakes were delivered to our door by the owner of Ladybug Cakes and Creations, the smiling, Jolene. The owner, Jolene Wiltsie, was an absolute delight to meet, and in our conversation, I learned quite a bit about her. Primarily, the "cakeologist" has the background to back-up the success of her 10-year-old business. The orange were delicious. Truly, dreamy-dreamsicle. Orange is a favorite flavor of Gerry's, so I really got them for him. He put a big stamp of approval on them. The vanilla? If you are thinking how mundane, you can think again. They were so much more than plain vanilla. Honestly, they may sound ordinary, but they are anything but that. These, melt-in-your-mouth mini-cakes are heaven in a paper cup. As I had to head out to meet friends for a girls Happy Hour and I wanted to share my new cupcake discovery, I devised a way to transport a single cake (I had no plastic containers, okay?). 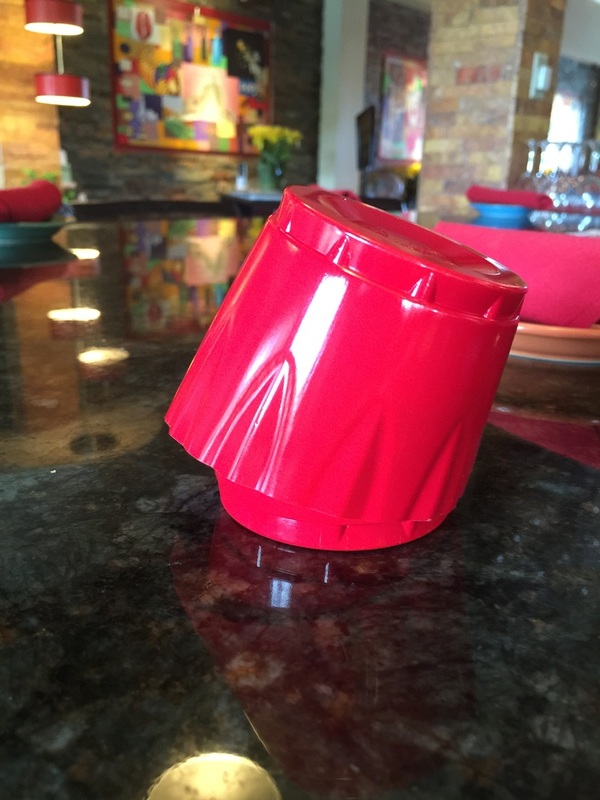 I took a red solo cup and trimmed it into the perfect cupcake container. I may be bad at coupon using, but I do my best to make things work. Jolene, the owner and cupcake/cake artist? I want other people to know some of the fascinating things I now know about her. So, I will be writing and Podcasting about and with her in the future. Stay tuned. Listen, if I were you, I would keep an eye out for her Groupon offerings. You will not be sorry. Of course, you could look her up on Facebook, visit her Website or just give her a call and order some of her delicious creations. The funny and talented lady at the helm of Ladybug Cake Creations has much more planned come fall/winter. Just wait until you hear! Until then, look her up on Facebook -- Jolene Jody Bolton Wiltsie, you will love her work. 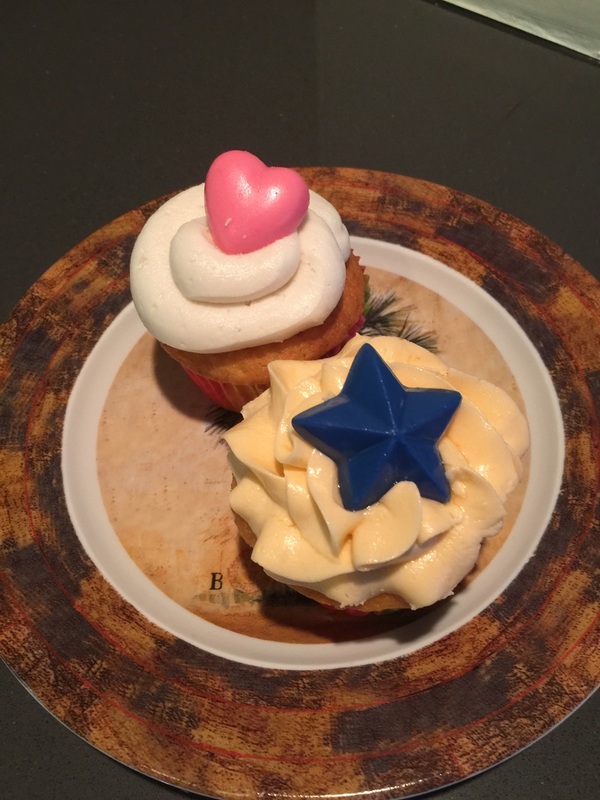 "Jolene's cupcakes make you smile inside and out. You can feel the love and excitment that she puts in each creation. But better than her cup cakes is the Italian chessecake she bakes.... It is not just a creation.... It is like very fine art...something of incredible beauty and bliss. "I need to order something now!" -- William K.